Wondering how to gauge your fat-loss progress? Here's straight talk about what the numbers mean for you! Occupation: : Strength coach, fat-loss expert, co-author with Dan John of "Fat-Loss Happens on Monday: Habit-based Diet & Workout Hacks"
Gauging fat-loss progress is always a touchy subject, and for good reason. How you choose to gauge your progress determines how you're going to treat yourself, and whether you're going to be happy or sad about the changes to your body. In the same way society and the media didn't teach you how to train well or eat properly for results, they also didn't teach you how to correctly gauge your progress. Let's start at the most obvious spot: the scale. The scale is both deified by the public as the ultimate measure of success and demonized by "enlightened" trainers everywhere. Like everything, the truth lies somewhere in the middle. We know exactly what the scale means. Barring terrible hormonal issues or metabolic syndromes—for which you need to see a doctor—if the scale is too high, you're eating too much. Here's where this starts to get fuzzy: Most women assume the scale is too high when it isn't. A woman who strength trains will probably be about 10 pounds heavier on the scale than she looks. All her friends will think she's 119 pounds, when really she's 130 pounds. Or whatever—you get the idea. "A woman who strength trains will probably be about 10 pounds heavier on the scale than she looks. All her friends will think she's 119 pounds, when really she's 130 pounds." This doesn't happen just some of the time; this happens all the time. It inevitably leads into the "muscle versus fat" conversation. Fat is the part that's jiggly. It takes up more space per pound than muscle does. That's why extra fat makes you look so much bigger. Muscle is the part that's lean and tight. It takes up less space per pound than fat does. That's why people who have muscle look "toned." That word is often vilified and doesn't really mean that much, except to describe the look that comes with trading some body fat for some muscle. There is no "long, lean muscle" versus "big, bulky muscle." There's just muscle or fat, and you get to choose which one you want more of. 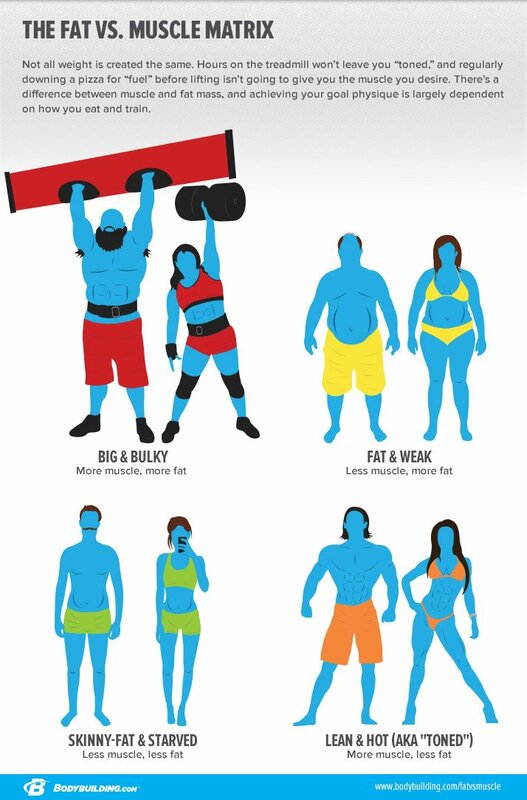 Looking at that list, it should be obvious that the goal is to add muscle and not gain fat. But still, there are plenty of women who got sold on the old-school "muscle is bulky" idea. And hey, everyone thought that back in the '90s—it's not just you. But now we know better; there's only muscle or fat. We don't have long, lean muscle. Muscle is lean. Fat is bulky. If someone isn't long and lean, it's because of fat. The toned look most women want is just less jiggly fat and more firm, tight muscle. And for guys, this is why it takes so long if you want to get huge and jacked: Muscle takes up so little space. It takes several pounds of muscle to take up the space a single pound of fat would have taken up. When you see someone who looks hot, remember that looking hot means more muscle and less fat. But people still don't get it. The most clichéd thing in the world is a woman who's completely skinny-fat and thinks she needs to lose five pounds. In reality, she doesn't need to lose weight—remember the "skinny" part of skinny-fat? The reason she doesn't look hot is because even though her scale weight is low, it's all fat and no muscle. The only way she can get the lean and toned look she wants is to gain a little muscle. The second most clichéd thing in the world is the guy who's 50 pounds overweight, but says he needs to go on a muscle-gain program. No; he'll look more muscular if he loses fat. Girls always think the answer is to lose weight. Guys always think the answer is to gain muscle. News flash, again: The answer is in the middle for both of them. They both usually need the opposite of what they think they need if they want to look hot. Relax, it's not just you; it's everyone. You don't see yourself exactly as you are. And you don't see yourself as everyone else sees you. Truth be told, most people never feel "perfect" no matter how lean they get. Body-fat percentage is an awesome way to know you're lean enough and can move on to other things. Part of this comes down to self-image and body dysmorphia. So trust me, and trust the numbers. Above 30 percent body fat: There's something to fix. For your health and for how you want to look, you really want to get leaner than 30 percent. At 26 percent body fat: You're totally healthy. Even though TV tells us a woman who's at 26 percent body-fat is average, the reality is most of America isn't healthy or average, and you're actually ahead of 80 percent of the U.S. population. At 23 percent body fat: You're really in shape now. You're officially a "workout girl" and you're ahead of 90 percent of the women in America. You're fit and lean, and there's nothing left to fix. Depending on your body type, you may find you're totally done at 23 percent. At 21 percent body fat: You're super-hot. You look great in clothes, you can wear whatever you want, and you should feel great wearing a swimsuit. At 19 percent body fat: You're a rock star. You look amazing in clothes; you can wear whatever you want. You can't wait for bikini season. You've officially won at leanness. Men want you, women want to be you, and you're the envy of all your friends. I'm only half-joking about that last part. For men, it's exactly the same sequence, but about 10 percent lower. Above 22 percent body fat: There's something to fix. For your health and for how you want to look, you really want to get leaner than 22 percent. At 17 percent body fat: You're totally healthy. Even though TV tells us a guy who's at 17 percent body fat is pretty average, the reality is most of America isn't healthy or average, and you're actually ahead of 80 percent of the U.S. population. At 14 percent body fat: You're really in shape now. You're officially a "workout guy," and you're ahead of 90 percent of the men in America. You're fit, lean, and there's nothing left to fix. At 12 percent body fat: You're wicked lean. You look great in clothes; you can wear whatever you want, and you should feel great taking your shirt off at the pool. At 9 percent body fat: You're a rock star. Most dudes will have a really flat stomach and abs at 9 percent. Women will swoon, guys will give you high fives, and if you walk around with your shirt off long enough you'll probably score a reality TV show. That's what I tell my female clients when they hit 19 percent body fat. And this is really, really important. This is what we use body-fat percentage measurements for: to give yourself a place where you can stop and say you got "there." Let me be more explicit: Body-fat measurement is not a tool to see how far you have to go. Body-fat percentage is a tool so you know when you can stop. It's about how you talk to yourself. You're already a rock star. There's nothing to left to fix. "If I have a female client at 19 percent body fat, I let her know she's done. We shift the context to fitness-related goals like mud runs, training for a kettlebell certification, running a 5K, doing a tactical strength challenge—really, whatever fun and cool things you've always wanted to be able to do." If I have a female client at 19 percent body fat, I let her know she's done. We shift the context to fitness-related goals like mud runs, training for a kettlebell certification, running a 5K, doing a tactical strength challenge—really, whatever fun and cool things you've always wanted to be able to do. You may get leaner from here, but it's not necessary, and it's not the goal. From the media: "You should look like this Photoshopped model." From most bloggers: "It's all Photoshopped and totally unrealistic." Not surprisingly, I rest in the middle. I always think of one female client who was insistent about getting down to 14 percent body fat because she wanted to lose every last bit of cellulite on her legs. And we got her down to 14 percent body fat, but she still had a little bit of cellulite and she was totally crushed. She had full-on eight-pack abs, and other gym members asked if she was a model, but she was hung up on the literally four square inches of her body that weren't perfect. It still makes me sad. It's the silliest thing ever, the way humans are wired. Everyone else sees and envies what's great about us, and we always see our flaws. I've had so many female clients tell me something like, "My husband is so totally amazed with how great I look now!" or "My boyfriend says he can totally tell how much my body has changed and he loves it!" This is usually when they get to 21-23 percent body fat. Let me set that apart for emphasis: Usually, female clients who start getting major compliments from their friends, family, and significant others are in the 21-23 percent body-fat range. This is nowhere near a Photoshopped-picture level. When I worked in a big gym, most of the clients I had were women who came up to me, pointed at one of my other clients, and asked, "What would it take to look like her?" And the client they were pointing at was usually about 19 percent body fat and looked amazing. Often, they'd point at the clients who were at 14 percent body fat and say, "I don't want to get that lean." Often it's easier to see this on other people than it is to see it on yourself. Even when you look amazing, when people in your life are telling you they can't believe how good you look, it won't look like the magazine covers. And that's OK. Reality is a really great place to live. Adapted from "Fat-Loss Happens on Monday: Habit-based Diet & Workout Hacks"